Whether you want to bake dairy- and egg-free for health, ethical, or environmental reasons, The Joy of Vegan Baking lets you have your cake and eat it, too! Featuring full-color photos and 150 familiar favorites — from cakes, cookies, and crêpes to pies, puddings, and pastries — this book will show you just how easy, convenient, and delectable baking without eggs and dairy can be. 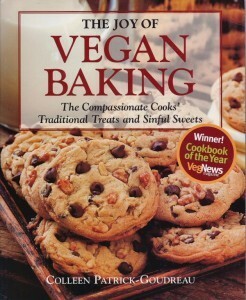 A seasoned cooking instructor and self-described “joyful vegan,” author Colleen Patrick-Goudreau puts to rest the myth that vegan baking is an inferior alternative to non-vegan baking, putting it in its rightful place as a legitimate contender in the baking arena. More than just a collection of recipes, this informative cookbook full of tidbits, food lore, and baking tips is a valuable resource for any baker — novice or seasoned, vegan or not.